You’ll find the Ottorink wine bar past Kotti, just along Möbel Olfe, and down on one of the quieter side streets this area has to offer. Sandwiched between the Babylon Cinema and Würgeengel bar, this place was opened by chef and winemaker Andreas Rink. Rink named the bar after his grandfather, Otto Rink, and is often seen flitting around the space making sure his guests feel comfortable. No need for that though, his staff is excellent at keeping an eye on things and making sure guest's glasses are always topped up. In addition to carrying many whites from Germany’s Mosel region, Ottorink serves a well curated selection of French and Italian reds, one or two rosés, and, of course, Crémant and Champagne. You’re free to try the wines before ordering, Ottorink makes sure to advise its customers with a lot of love. Our bottle of Georges Descombes Morgon came in at a solid 38 Euro and we accompanied it with a delicious ham and bread plate, as well as some pickled vegetables and cheese. The charcuterie was outstanding quality, though it did leave us slightly hungry. To be fair, the food here should be viewed complementary to the wine, rather than the other way around. Bottom line, the plates are much better suited for snacking rather than dinner. They also serve plates of pâté and the occasional quiche. After we killed the bottle of Morgon we decided to get just one more glass, which ended up being the outstanding Z wine by Oliver Zeter. The winemaker refers to this as his "slow wine", made from handpicked grapes from his best vineyard and allowed to spontaneously ferment without any clarification. It's got an incredibly dark color with mineral notes and hints of dark berry, chocolate, and sweet and sour aromas. I could drink this pretty much any day of the week. Oliver Zeter’s bottle costs 36 Euro. To make sure it’ a Sunday Funday, head to Ottorink from 6pm onwards, which is when they pour glasses of their open bottles for 4 Euro a pop. Sounds like an ideal scenario. Schnell am Kotti vorbei, am Möbel Olfe entlang und ab in die entspanntere Seitenstraße: zwischen einem Kino Babylon und der altehrwürdigen Würgeengel Bar lässt sich gut Wein trinken. Der Koch und Winzer Andreas Rink hat hier bereits vor einigen Jahren seine Ottorink Weinbar aufgemacht, benannt nach seinem Großvater Otto Rink. Ausgeschenkt werden hier neben vielen deutschen Weißweinen aus der Mosel-Gegend französischer und italienischer Rotwein, der ein oder andere Rosé und natürlich Crémant und Champagner. Jeden Wein darf man zunächst probieren und beraten wird im Ottorink mit viel Sorgfalt und merklich Liebe zum Wein. 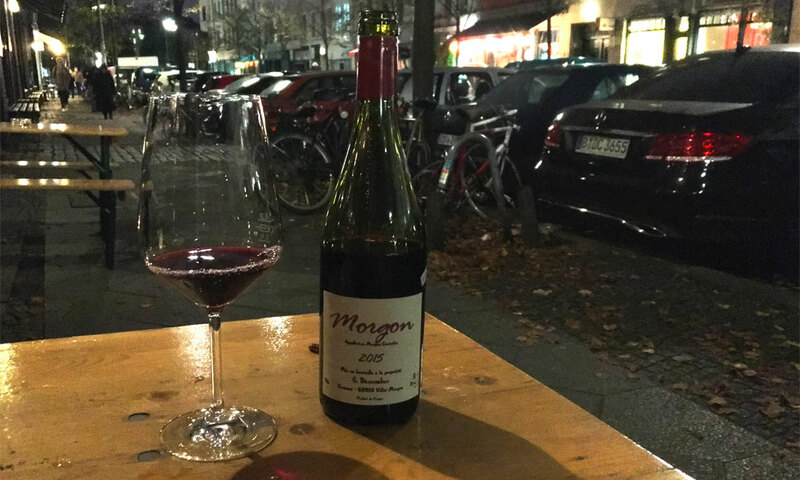 Wir hatten zu unserer Flasche Georges Descombes Morgon für völlig solide 38 Euro eine der köstlichen Schinkenplatten und Brotzeit-Teller mit eingelegtem Gemüse und Käse. Die Produkte, die auf dem Teller landen, sind von herausragender Qualität, allerdings wird mit einem Mordshunger vermutlich nicht ganz satt. Darum geht es hier aber auch nicht, sind die Platten doch Begleiter für den Wein und nicht andersherum. Auch eine Terrine oder geräucherte Kabeljau-Leber oder die gelegentliche Quiche werden kredenzt. Der erste Moselwein darf übrigens ab 18 Uhr ins Glas, da öffnet sich nämlich die Pforte von Ottorink. Sonntags gibt es Restetrinken, da werden ebenfalls ab 18 Uhr die noch offenen Flaschenweine für traumhafte 4 Euro pro Glas ausgeschenkt. Irgendjemand einen erstrebenswerteren Sonntagsplan in petto? Wir denken nicht.